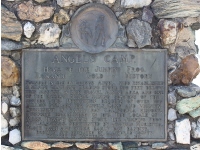 Founded in 1849 by George Angel, who established a mining camp and trading store 200 feet below this marker, this was in a rich gravel mining area that was also one of the richest quartz mining sections of the Mother Lode-production records reached over $100 million for Angels Camp and vicinity. 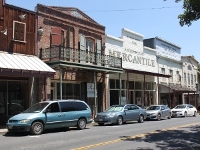 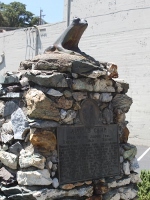 Prominent in early-day California history, it was said to be frequented by Joaquin Murieta, Black Bart, and other early-day bandits, and was the locale of Mark Twain's famous story, The Jumping Frog of Calaveras County. 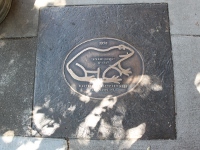 Bronze plaques in the sidewalks downtown list champions of the frog jumping contests. 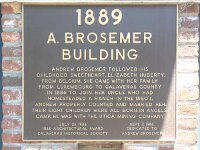 Plaque on the Brosemer Building, one of a number of historic buildings downtown. 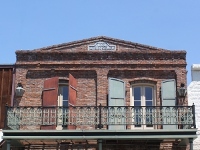 Second story view of the Brosemer Building.